Swedish researchers have developed a new paper-like material that can store as much energy as market-scale supercapacitors and batteries. ‘Power Paper’ is a 15cm wide, less than 1mm thick, sheet of conductive polymer that can store as much as 1 Farad of energy. It has been developed by researchers at Linköping University’s Laboratory of Organic Electronics and could ultimately serve as a sustainable replacement for current batteries. The paper has already set four world records for highest charged and capacitance in an organic electronic, highest measure current in an organic conductor, highest capacity to simultaneously conduct ions and electrons and highest transconductance in a transistor. The structural foundation of Power Paper uses high pressure water to break down cellulose fibres before adding an electrically charged polymer to the solution to create a thin coating around the fibres. The material can be recharged hundreds of times and each charge only takes a few seconds. The paper is also strong and durable with the researchers using one sheet to create an origami swan. Unlike market batteries and capacitors the paper is waterproof and created without the use of dangerous chemicals and materials. Power Paper has been financed since 2012 by the Knut and Alice Wallenberg Foundation. The researchers have also just announced that the Swedish Foundation for Strategic Research is funding the project to the tune of SEK 34 million – more than £2.5m – in order to develop a paper machine that will mass-produce the power paper. 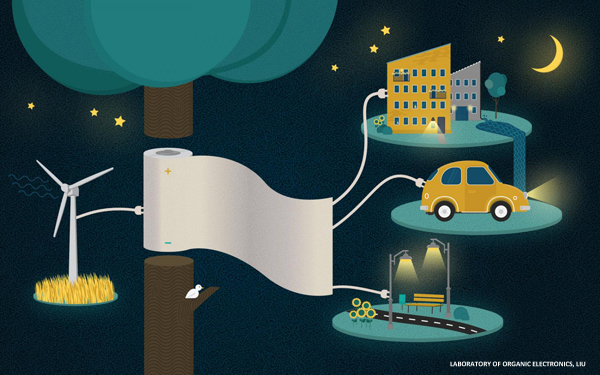 The potential upscale of the paper could come at a time where the energy landscape undergoes a ‘megashift’ towards energy storage, particularly batteries. The International Renewable Energy Agency (IRENA) has also warned that energy storage capacity must be tripled by 2030. The new paper storage method continues the recent trend of uniquely innovative low-carbon technologies receiving funding. Earlier this year a new technology which uses the force of gravity to generate electricity that can be used off-grid won £150k of funding to be scaled up across the world. Elsewhere an American solar firm launched a liquid technology that turns regular windows into solar panels which could be up to 50 times more productive than regular roof-based photovoltaics.